Autumn is my absolute favorite time of year, although not for the reasons you might think. Sure there is the colorful splendor of the changing leaves, and that clean crisp fragrance in the air that says the holidays can’t be too far off. But what gets me most excited about the Fall is that it’s apple pickin’ season. For me, there is something very romantic about journeying with family & friends to one of the many local orchards in New York and Connecticut. 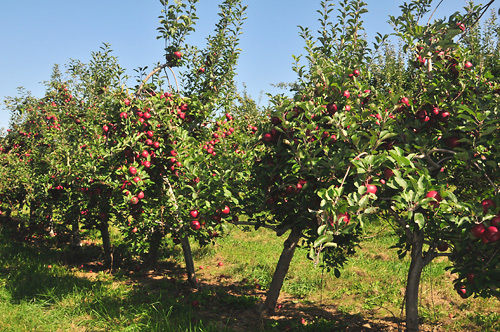 It’s very special to spend a leisurely day together… picking apples, sipping cider, and meandering through corn mazes. All a much welcome departure from the fast-paced lives we’ve come to know. When the day is done my mind will often wonder to memories of Autumns past, to Thanksgiving around the dinner table, and in particular to my sister’s homemade apple pie. Roseann is quite the natural baker, and on holidays, the dinner conversation will inevitably turn to guessing which of her fantastic desserts she may have prepared this time around. Of course I’m always hoping for my favorite—her wonderful apple pie. It just melts in your mouth, and is still, to this day, the best I’ve ever tasted. Special thanks to Roseann for sharing, and for all her help in baking & shooting the pies for this post! TIP: If you’re like me, you believe that apple pie shouldn’t crunch when you take a bite, so use naturally soft apples like Macintosh or Cortland. It makes all the difference. • Preheat oven to 425F. • Line 9″ pie pan with one pastry. In large bowl stir together apples, sugar, flour, cinnamon and salt. Spoon into pastry-lined 9″ pie pan. Dot with butter. Cover with second pastry; fold overhang under; crimp and flute edge. • Brush pastry with milk; cut a few slits for steam to escape. 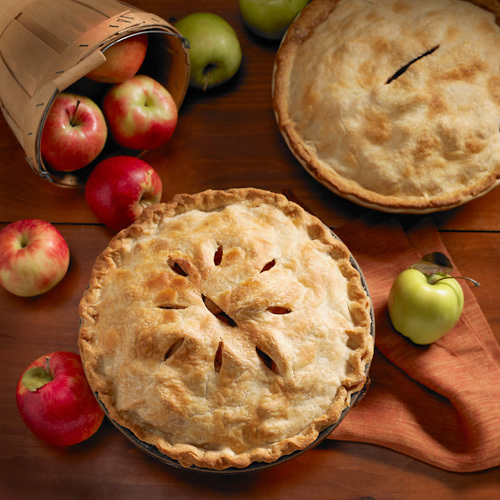 • Bake 40-45 minutes until pie is browned and apples are tender. To prevent over-browning, cover pie loosely with tent of foil after 20 minutes. Cool on wire rack or serve warm with vanilla ice cream. This pie looks beautiful. And delicious! Your pies look perfect! Yum! Wonderful recipe and photo. And it makes me think of Yogi Bear! Wow! I love making homemade pies, but for some reason mine never look that yummy. Thanks for the recipe! You’re welcome Joe; Both pies were delicious. See ya soon.